It’s almost summer and wool festival season is upon us. In fact, I’m going to one this weekend: Shepherd’s Harvest. Today’s Knitting and Crochet Blog Week topic is “Something Different.” So I thought I’d try my hand at creating a game. Challenge your fiber buddies to a game the next time you attend a festival. Consider making things interesting with a wager. Thanks. I’m going to play tomorrow. I hope I can find someone else who want to play too. Love it! 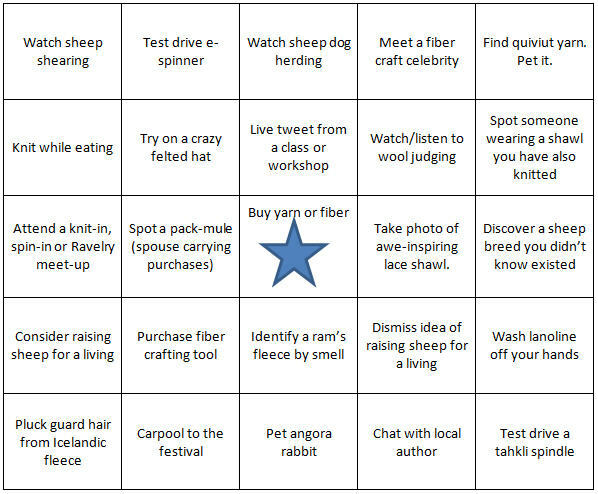 So playing this next time I go to a fiber festival.